I just love the colours of Autumn – the reds, browns, greens, golds and oranges that seem to speak of cosiness and warmth and evenings indoors wrapped up on the sofa. I love the crisp cooler air that means it’s time to put on a sweater and get out the wool to knit or crochet a new scarf and hat. I love the crunching sound of leaves under my feet and sitting in front of the fire at night with a crocheted blanket on my lap and lots of candles dancing on the walls around the room. I love how my cooking changes as the days get cooler and the salads and barbecues of summer change to soups, stews and hearty casseroles to warm and nourish. I love getting out my recipe books and planning crumbles, pies and delicious treats to make use of all the amazing fruits of the season. I have many happy memories of coming home from school to be met with the smell of freshly baked apple pies and scones just out of the oven. In Autumn more than other seasons I find that the smell and taste of food evoke childhood memories. At this time of year, I love to decorate the house with a few bits and bobs that bring the Autumn indoors. I try to find a new piece to add to the collection each year, this year it was some silk leaves in fabulous Autumn shades. 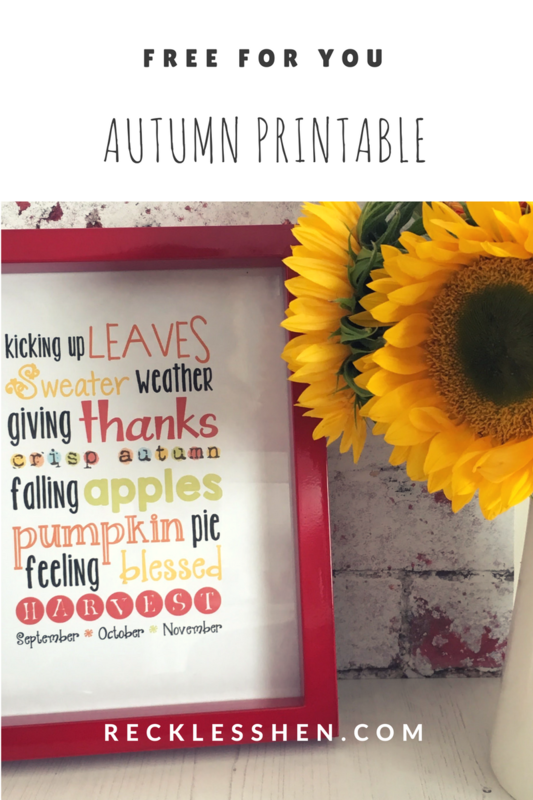 I also made an Autumn themed printable to frame and put on the table in the hallway. I was so pleased with it that I thought it would be a nice freebie to giveaway so you can download it from the link at the bottom. It is designed to be A4 size but I trimmed mine to fit an 8 x 10 frame as I found a lovely red frame hidden away in a cupboard that I had put away ‘somewhere safe’ and forgot about. Free Autumn printable from RecklessHen. 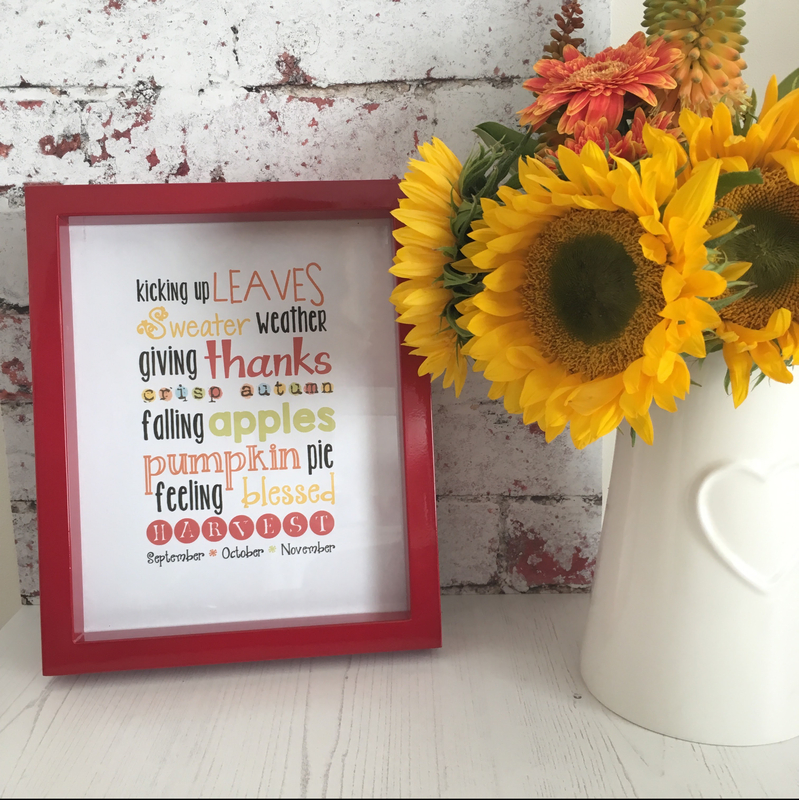 Our Autumn wordart printable is Free for Personal Use only. We hope you like it and can use it in your home, we’d love to see a picture if you do. Leave a comment if you have an idea for a free printable you would like to see on our blog and don’t forget to follow us for updates. you are very welcome, I hope you can use it.